I am a mama who struggled with postpartum depression. That was nine years ago, but I’m sharing my postpartum story with you today — all these years later — because I think this is an important conversation for the church to have. How do you feel that the church addresses issues of mental health? How about your church? When I suffered with depression, I was very reluctant to ask for help, and I didn’t let anyone in my church know about my struggle. I felt a deep sense of spiritual failure. I knew what the fruits of the spirit were, and I didn’t feel any joy. I felt like a disappointment to my faith. My hope, in sharing this story, is that anyone suffering will seek help, let go of the guilt, and know that there’s hope and healing on the other side. So much about those days is fuzzy, but I still remember groping around in the dark of my mind. It seemed that all the color had been sucked out of my life, which was a lie, but that’s the way it all looked to me. And felt. Just gray. I didn’t understand why I felt this way. Me, with a happy marriage, nice home, healthy toddler, new baby. Who but a spoiled brat would be crying when she’s living any woman’s dream? What kind of wife and mother was I anyway? They call this “rock bottom,” I guess. Some people find it at the bottom of a bottle or when they slip their last dollar into a slot machine or when they wake up one morning and realize that they messed up real bad the night before. 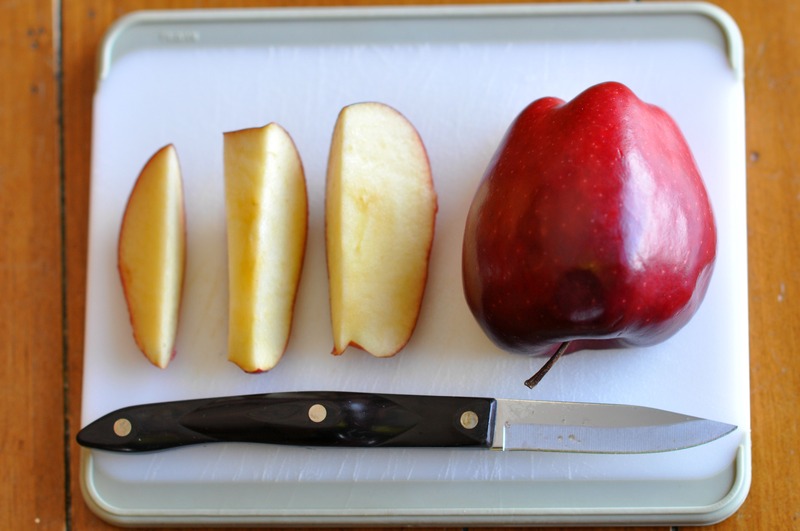 But here is where I scraped against my rock bottom: cutting up a red apple for my daughter. It was 10 p.m., and the baby was finally asleep. My 2-year-old was still awake, though, because I guess I’d forgotten that she had a bedtime. And it shocked me, how I’d forgotten. That self-accusing voice hissed at me, What kind of mother are you, anyway? She asked for an apple before she went to bed, so I pulled a Red Delicious from the bottom drawer of the refrigerator. I remember thinking at the time that I hadn’t done anything for her all day long, except cut up this apple. Which was a lie, but I couldn’t always tell the difference. I peeled away the skin because she didn’t like her apples with skin, and I picked out the seeds. I handed her the apple slices on a plastic Dora the Explorer plate, and I sat down with her at her tea-party table. Folded into a child’s chair across from her, I dropped my head into my hands and sobbed. Because what kind of mother waits until 10 o’clock at night to do something nice for her child? I had read about mothers like me—mothers who couldn’t cope—in the pamphlets that the nurse gave me before my first baby was born. None of it came true for me, and I was happy with my first baby—always and only happy. But it was different with my second baby, and as I searched for answers, the probable diagnosis pulsed in the soft glow of the internet: postpartum depression. I read that this condition was “normal.” Whatever normal was. But this didn’t feel normal—waiting until 10 o’clock at night to serve an apple to my child. The online experts said I should seek help. But, no, I wouldn’t ask for help. Not me! What kind of mother of two would be so needy, when mothers of four and five manage just fine? So I called her the next day, my sister in Kansas City. Would she come? Would she drop everything—her life, her own kids—and drive six hours north to help me so I could do more than slice up an apple for my little girl? The first night she was here, my sister stayed awake all night cradling my crying baby while I slept. I went into my bedroom closet that day, and for the first time ever, I fell to my knees before the Lord. I dropped my head onto the carpet in the dark closet beside the laundry hamper. Right there, I aired my dirty laundry to Jesus. My feelings of guilt and despair. My inadequacy. My stiff-necked pride. All of it. I did most of the talking, and he didn’t seem to mind. “Lord, give me enough grace for today,” I prayed. My sister says that on that day, I came out of the bedroom a different woman. She said she didn’t know what happened in my room, behind that closed door, but she said I was a new person when I walked out. I focused on the single step before me, rather than the miles-long journey ahead. I took that same single step, day after day after day, leaning into each day’s grace. I trusted that it was just enough for my day, and that tomorrow He would provide again. The days felt long, sometimes, but months later, I looked back and saw how far I’d come — the evidence of daily grace, every day. Yesterday, I was cleaning out the drawers in the kitchen. I found my sister’s note about daily grace in the drawer by the oven. It was lying under a stack of old catalogs. I don’t take those pills anymore. I would if I needed to, but I stopped years ago. God cleared the gray and brought color back into my life as a mother. And for some reason, the day I stopped taking the pills, I tucked my sister’s note into this drawer — as if grace daily were no longer required. But when I found the note again, I took it from under the pile and taped it to the pantry door. Because who would throw away the handwriting on the wall? I still need His grace, for this day and for always.
. The book includes essays from Nancy B. Kennedy, Melanie Shankle, Sophie Hudson, Lynn Cowell, Glynnis Whitwer, and many others. For more details on the #TellHisStory linkup, click here. I apologize to anyone who tried to comment before, and found that these comments were closed. I have no idea what button I pushed to close the comments, but in any case, they are open now. I invite each of you into the discussion, and I apologize for any confusion. Thank you for your grace! I can identify with this Jennifer – with the same depression after my second little boy was born to so many other things in my life where pride seems always to want to take over. This grace for today. What precious wisdom. I am praying for grace to live moment by moment. He is more than sufficient when I have sense enough to let go of pride. Thank you for being brave and sharing your story. It is true. Our stories encourage and bless others. Love you! So familiar and yet so hard to remember at times. One day at a time. I’ve struggled with depression off and on throughout my entire adult life. I’ve heard it all from the church, pray harder, have more faith, read your bible more, why don’t you just choose joy, you probably have unconfessed sin in your life. But the last bout of severe depression was when I was blogging and I wrote about it a lot. People in my life stepped up in ways my heart so desperately needed. To know I was not alone, that it wasn’t my fault and I couldn’t make it just go away with positive thinking and longer quiet times was a balm for my soul. I could rest with the pain knowing God was somewhere in it with me and the “church” women who gathered me up and loved me right there? Well, that might have been the medicine I needed to feel free. There is so much shame attached to mental illness and we do people such a disservice when we detach ourselves from other peoples invisible illnesses and dismiss them as fiction or worse as their fault. Alia, I”m so sorry for your depression, but so grateful to see how people rallied around you. When you said *shame* that really resonated, because my brother has been diagnosed with some mental issues, and he feels so ashamed. But there is nothing to be ashamed about. I’m so glad he is finally getting help. Thank you for your words here. Lynn, I’m glad your brother is getting the help he needs. Thank you so much for your loving concern, Jennifer. I am so grateful to you! Your words are profound and important. Thank you for sharing your story with us, Alia. I would guess the comments being turned off is more likely a technical glitch than something you did. I think it illustrates your story about depression: sometimes a bio-chemical switch gets flipped (website settings), and we find ourselves cut off from normal mental functioning (software problems), cut off from from communication with others (no comments), and seemingly cut off from fellowship with God (no replies from the author). Thanks for sharing this story about postpartum depression. I’ve been there–after a difficult birth and extreme sleep deprivation. I wish I’d heard your words then. It is so tempting to dissolve into self pity in this post. I have struggled w/ depression for years. I had a pretty disfunctional homelife growing up and my parents were difficult to deal w/ well into my adulthood. They were adept at making me feel not needed, not worthy of respect…I entered into a marriage that was difficult-my fault as well as his-simply to escape my parents. Thankfully we were both Christians but VERY immature people. My husband simply did not understand and frankly sometimes did not really seem to care much about the emotional struggles I was dealing with. Seventeen years into our marriage, God did a major healing in our relationship.My husband has dealt w/ alot of remorse re his neglect toward me those years and I have more love and respect in the way I treat him. In regards to my parents, i literally had to get mad more than once with them and basically demand that they talk to me respectfully. I distanced myself from them and still maintain definite bounderies. We can now talk on the phone and even joke. God mercifully moved us farther and farther away from them as the years went on and while we raised our children. (My parents, in the early days, not content to trample on my feelings, also hurt one of our kid’s feeling more than once.) I have in the past struggled w/ severe OCD-thankfully mostly healed by our Father although it was a process of following steps He wanted me to take and not an overnight transformation. I have dealt w/ severe PMS, to the point that it was not uncommon for me to literally want to die during that time. i started on an anti-depressant for that-so thankful-and the one the dr. put me on also helped undiagnosed ADHD. I recently went on a med for the ADHD and it has helped SO MUCH. I know I am rambing here. I have so many regrets about raising my kids. I just was not there mentally and emotionally enough. I seem to always feel so overwhelmed. I am now reaping the consequences of that neglect w/ one of our daughters who needed me so much and i just bailed emotionally and mentally on her. I wish i could redo raising her knowing what i know now about God’s love for me, having the meds i have now and the growth both spiritually and emotionally that God has done in me. I am truly sorry for such a downer and self-pitying post. I am truly thankful that issues such as depression, PMS, ect. are more out in the open now. Not so much the case when I was much younger. Not only does more available knowledge and for some, meds, help, but it is also nice to know I am not alone. I can relate to so much of your story. Growing up in a dysfunctional home and your marriage and feeling overwhelmed with life and guilty for not being more present with your children. God can redeem your time and know that He gave you those children just as you are on purpose. He is forming a beautiful story for them too. You are enough. And God knows what it will take for each of us to fall into His love for us. Just sharing what I tell myself. May God continue to bless you. You are loved. this is fantastic and so deeply touching. I think that I had un-diagnosed PPD because my (at-the-time) OB didn’t believe in freely diagnosing it, and so I went untreated. I praise God that I am now with an OB that guides and loves and helps, and that she will be keeping an eye on me during successive pregnancies. this transparency, this raw honesty…thank you. I love you, dear one. I am glad you have the support you need now. I love you, too, Rachel. Beautiful story. Thanks so much for sharing it. If we could all be filled with the grace to be at church with our real faces on. And to do so without fear of rejection. I think the church ” turns a blind eye” to people with issues. We all have them, some are just different than others. People who have “issues” require time. Most people don’t want to invest their time, so they pretend they don’t see them. God doesn’t have limits on his time for us, we need to have the same perspective as God. He created us, issues and all, perfect in his sight! It saddens me that people have to be ashamed, I have been there too, and felt alone. I didn’t reach out for help, but I prayed someone would “notice” me. My guilt and shame prevented me from asking for help too. Wouldn’t it be awesome if the world was more open to acceptance and just love them, broken and beat up! Battle wounds, healed by God! Lets just sit around a table, wine in one hand surrounded by good friends and compare scars, I am proud of mine! Wise words here, Angie. Grateful for you’re willingness to share in this space. This just makes me cry. I so relate and I don’t like taking time, and I’m afraid that I’m going to reach my time limit with God and He will be done with me. But truth is that there is no time limit. Good words! Thank you. Jennifer, I know I’ve read this. Perhaps you’ve shared it before? Many of the “saints” have suffered from depression–King David, Charles Spurgeon, you, I….we all love(d) the Lord, and yet when we’re in the pit we can’t get up. I’ve suffered from serious depression since I was a young teen. I didn’t know what was wrong with me, and no one gave me my condition a name. Gradually, it deepened to suicidal depression, and while I desperately wanted to die every day of my life for ten years, mercifully, God stayed my hand. Of course, I think, too, that Satan has a field day with this, with his blazing darts firing straight and fast at our minds and hearts. He would love us depressed, and frankly, He would love us dead. The Church has partnered with him in this, in a way, because we have stigmatized Christians, especially, those who suffer from depression. They’re not good enough, faith-filled enough, relying on God enough. And should we, who are depressed, dare have enough nerve to ask for their help, we are often shot down. While I have not been suicidally depressed in some time, I still have wrenching bouts with depression, where I am immobilized. Not all that long ago (maybe a couple of years), I thought I was losing my mind (meaning, in great angst and despair). I thought I might need to seek professional counseling and cried out to a fellow sister and colleague, someone whom I respected and who had mentored me. And if a curt, self-rigihteous email, she basically washed her hands of me, because she said I wasn’t trying and wouldn’t follow her advice. Baring my soul to her like I did was a painful thing to do–admitting that I thought I needed professional help. And she? She sent me her Dear Jane email–short, sweet, cutting. It was crushing. It’s responses like that that cause us to burrow further under. And it’s stories like yours, shining in the clear light of day and the clear brilliance of transparency, which heal and help and offer such hope. Surely God has prompted you to share this now. I know someone needed to read it. I know someone is despondent. I know someone needs HOPE. Of course, if someone is in great despair, she should seek both spiritual and professional help–that goes without saying, and certainly immediate help should she be suicidal. Also, for me, as I expressed in my book, Love Letters to God, the Lord used prayer-journaling in a life-transforming way to draw me close to Him and bring comfort and relief from depression and despair. Writing, too, (especially to Him) brings healing. God bless you, Jennifer Lee, for being brave and truthful and compassionate. Have you a sense that the church has made strides with regard to the way it treats those with any form of mental illness? It’s been my general experience, that, no, the Church (I can only speak generally and from personal experience) has not made great strides in how it accepts or helps those with mental illness. I think part of it is because it seems different from physical illness and affects our mind, heart (Biblical definition), and emotions–things that Christians are supposed to have under control (as in self-control, a part of the nine-fold fruit of the spirit). So when we are depressed or mentally ill, it makes us seem spiritually deficient. Also, Jennifer, I think, in general, that Christians, as a whole, have great difficulty in being transparent before each other. I’m not referring here to mental illness, but rather we just don’t want people to know we have problems or that we sin. Lack of transparency is a HUGE issue. “Encouraging transparency” is my purspose statement and I try do that in what I write and also in my journaling classes. I wish more churches had journaling classes, because often when we write what we feel and read it back to others, it gives us the courage to be honest/transparent. Thanks for asking me and for inititiating what could be a life-saving dialogue! Wow! Life-saving words, indeed! A lot of churches use shame to control and manipulate people into ‘obedience’ and outward ‘signs’ of godliness so that they can brag on all the ‘good fruit.’ But, when we give God control of our lives, He does a thorough renovation, and it’s MESSY to say the least. It isn’t pretty, but He has to tear down all the walls that kept us hidden and prevented us from His love and love from others so that He can build us on His foundation which is the essence of Love and sacrifice – Jesus! Only then, can we truly stand – after all has been stripped away. God loves us so much through all of this and His work is not complete until we go Home. I do believe that He wants to heal us and redeem us on this side of Heaven, and that process is continuous. He is faithful to complete what He starts in us even when it looks like we’re getting worse and we wonder if we’re going the right way at all. He looks out for His children and seeks those who are lost, so that gives us hope and His hope does not disappoint. Paula, this is so wise. I love that renovation idea. I thnk we often think that as soon as we are saved, we are complete. Yes, of course, we are complete in Christ. We are completely forgiven and completely loved. But that renovation process of which you speak–our sanctificaiton–is an ongoing process. I love that image of tearing down walls, because that’s one thing shame does: keeps us hiding behind heart walls, or walls of pride, or walls of pretense. Here again (I am on my personal soapbox), I thnk journaling can help us level those walls, with the Holy Spirit’s help. There is something about writing, that helps us tear down barriers with our pens. Thank you for your rich comments to me, Paula. Wow, Lynn. Thank you for sharing your story here too. I’m sorry about the letter from your friend. I have experienced similar scenarios from individuals, and weakness of any type was shamed at my old church so the only two options were hiding my pain and pretending to be okay or being honest and getting cut off. I have learned to be more transparent, but I still feel like a loser for not being able to get over it all and feel like if I share too much, I’ll run people away. I have been writing letters to God, and that does help. I still ask God to take me Home most days, but He gives me hope to live. (And just so you’re not worried, I do see a counselor). God sustains me. There’s a hard line between being completely honest, but also not wanting to raise red flags because I do trust that God will help me make it. May God continue to bless you. Thank you for sharing! Paula, what an encourager you are! Thank you so much for reaching out to me with your compassion and wisdom. I’m so sorry that you have and do suffer from depression, and that it has been so bad that you pray for God to take you Home. I truly understand this, and have prayed the same prayer. But I’m so glad that we can cry out to Him for help in our despair and that we can also seek His human professional helpers. God will not abandon us, and while He certainly will take His beloved Home to heave one day, He has a purpose for us now. And I can see that part of yours is your loving transparency and bravery in speaking truth about your feelings and God’s provision. You are helping others with every word you write. Keep writing your “love letters to God”! I know He will use this from of prayer (which is especially conducive to cathartic release) to help free you and to draw you closer to Him for the help He promises to give. Thank you again so much for your loving response to me! Oh goodness no, Paula. NOTHING is too big for Him. We;’ve all felt shame, and sometimes, yes, we’ve done shameful things (I had an abortion), but the thing is that CHRIST TOOK OUR SHAME UPON HIMSELF and forgives us completely. And other times, Satan just wants to shame us, when we have not done anything. In either case, Christ is enough to cover it all. Oh I love how He is shedding truth in your heart. What a precious lady you are! I know that place in the closet – right on the floor where you just let everything fall out – to Him. He was the only one who could lift me up! Not from postpartum depression but teen rebellion and its effects on family. In order to get the support we need, those masks need to come off. Sending you a big hug for sharing this story of overcoming! Thanks for that hug, friend. I love you. Thank you for sharing your brave story. I know several who have struggled with depression and anxiety and how it would be viewed within the church. Thankful for ones like your sister who love no matter what and for that grace that gets us through each day. How can we better serve the hurting, within — and outside of — our churches? We can we practically *do*? We don’t always wear our depression on the outside, and we can get away with hiding — unlike someone, say, with cancer. I want to be able to really SEE people, and to respond with love. You really do SEE people, Jennifer! You have a beautiful heart that inspires courage in others! I love you. Thank you for seeing me. Jennifer, what a heartfelt story. I have an older sister who has struggled with depression most of her adult life, but she is well today and for that we are grateful. I remember when my twin sister was going through a divorce, and dealing with her own depression of sorts, she said what kept her going was praying every day for “daily bread.” That’s how Jesus taught us to pray, “Give us this day, our daily bread.” Just enough for today, Lord, because that’s the only time we have is the present day. Dayle! I’ve not “seen” you in so long! Such a surprise. I hope you are well. I”m so sorry about your sister. My brother was literally just divorced (unwantedly) after 32 years of marriage. He is so depressed, and our hearts break for him. So difficult to know how to help him. I love how your sister is seeking the Lord. I remember when I left a full-time career to raise Sheridan, that I would ask God for my “daily manna slice.” And He gave it to me. Loved seeing your beautiful photo here. Dear Lynni, I’m just now seeing this. So very good to see you, sweet friend. I’m sorry to hear about your brother. Life is so hard sometimes. Thank you. I just recently wrote about this exact thing and linked up on A Mama Collective – which brought me to this post. This mess is REAL, and just that- a MESS. I am finally starting to walk out of the drudgery of my baby blues and this post gives me tons of hope and encouragement for tomorrow. One day at a time. One day at a time. Thank you Jesus for grace. Walking it out with you is easy. Jennifer, thank you for sharing this story. It encouraged and blessed me! Thank you for sharing this, Jennifer. I, too, never wanted to admit I struggled with anything until I hit ‘rock bottom’ and felt like I really couldn’t take care of my kids. I couldn’t motivate myself to do anything and found myself crying all the time. I was so afraid with all my life flashing before me – there were times I thought spies were going to come get me. Since this is definitely not how a Chritian would act, I couldn’t shake the feelings of condemnation so I gave up – angry at God. I’m thankful that He pursues us when we’re lost and He wins our trust and affection with His love. My journey through this valley isn’t over yet, but I know God does give me enough grace for each day. I’ve been reading in Exodus just this morning about manna, and how God gave them the perfect amount for each day. Same with grace, yes? He gives us exactly what we need every day, without any striving or earning on our part. I appreciate you sharing your story, Jennifer. I have dear family members who often struggle with depression and I’ve seen how devastating it can be. I praise God for your healing and I look forward to the day everyone will be healed from it in the fullness of His presence. I’m sorry you struggled Jennifer. I know that colorless world. The 3 months after my only biological child’s birth were like that. But I swear, the martyr in me wouldn’t tell a soul about my complete lack of joy. Because of course, I had it together. It’s hard and you’re right about the church being a difficult place to come to for help. Suggestions of unconfessed sin and prompts to pray harder don’t help. In times like these I think our spirits are crying out to be known. When we share the story we let the lies go and can be loved back to life. The timing of this discussion, these comments, the rawness of truth; it’s is unreal to me. God is the best. The best. I just recently posted about my third son’s life- whom in the beginning my depression had convinced me I didn’t want-and as a Pastor’s wife I walked it out in the secrecy of my heart and our home. This morning I was praying about removing it or adding additional thoughts. But you are right- there is freedom in sharing. There is life in knowing God is bigger than the lies. Thank you. Oh bless you friend. When I think of the lies the enemy whispers…so, so painful. But God provided His truth through your sister and healing through Him. Oh what a beautiful painful story. You are giving light to the shame so many women carry. Thank you! Oh, this story and His grace…so good! I don’t have children, but I do know so much about the dark depression that hits and stays. And I know the beautiful healing power of our Almighty God!! 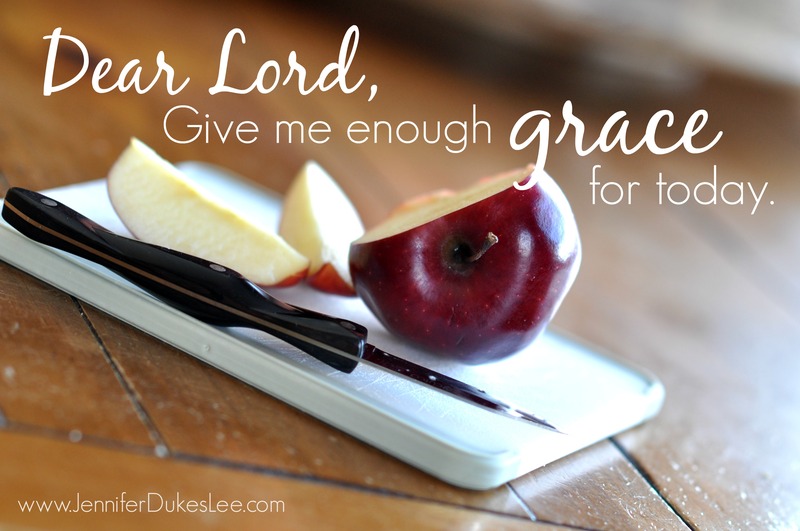 Grace grace grace….I cannot live without it. Thank you so much for bravely sharing your story with us Jennifer! We need to know we are not alone. This is my first time linking up…grateful to be here.